I got this recipe of Rajasthani pakoda from a roadside restaurant while returning from our trip to Rajasthan. It was like this, we ordered pakoda in that restaurant and when we tasted them, they tasted different. We asked the chef and he told us the recipe. I modified it according to us and used hand blender to get the batter. 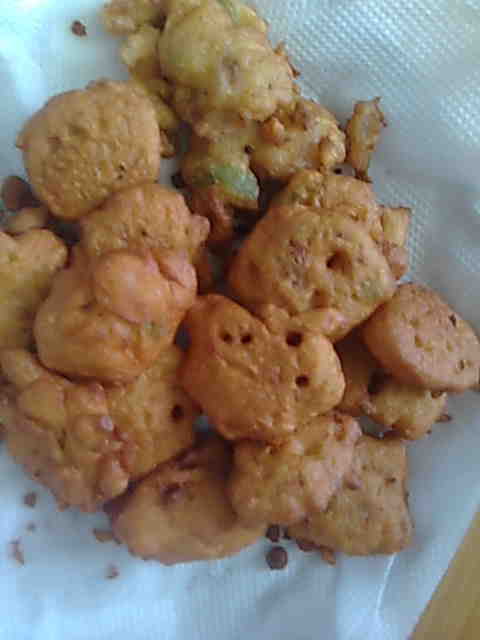 It’s very easy and pakoda taste awesome. 1. In a hand blender chopping jar, add besan, roughly chopped onions, tomatoes and green chillies, salt, coriander leaves and 1 tablespoon water. 2. Run the hand blender till you get smooth batter. Adjust the quantity of water. 3. Heat oil in a wok/kadhai and put small quantities of batter in the oil. Deep fry till golden, turning as needed. Drain pakodas on an absorbent paper and serve hot with tomato sauce or chutney.